This resource is aimed at younger pupils or SEN pupils at the beginning of work on learning 2D Shapes. Laminate the resource and cut up into 4 separate cards. 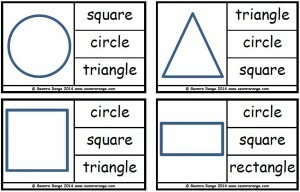 Pupils should look at the shape on the left side of each card and place a peg on the correct answer on the right side of the card.